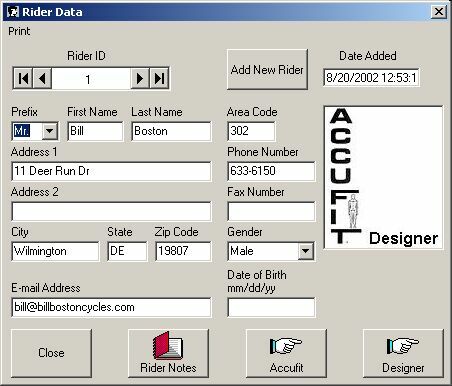 The Rider Data form contains most of the personal data that you will want to track for each of your customers and is the starting point for all design work. In addition, there is a Rider Notes form that you can customize to track additional data. The Add New Rider button is used to add records for additional riders. When this button is used, corresponding records are added for the storage of anatomical and design data for each rider. From this form, you can either proceed to a sizing session and then transfer the Accufit Size Data to a design session or go directly to designer and insert your own design parameters. For the tutorial, we will start out with Accufit.